Do you suffer from itchy, burning, red or tired eyes? Are you tired of all the drops or warm compresses and other ‘solutions’ that give you little to no long-term relief? If so, you’re not alone. Over 10 million people in the US alone suffer from dry eye. ReVision LASIK and Cataract Surgery Center has a premier Dry Eye Clinic with an amazing treatment that could give you long-term dry eye relief without the daily drops. This exciting treatment is called IPL – intense pulsed light and a package of 4 treatments are now available on the Discount Shopping Club! It is a painless procedure with no downtime that can provide immediate improvement for dry eye sufferers, treating the cause of dry eye to improve tear flow. 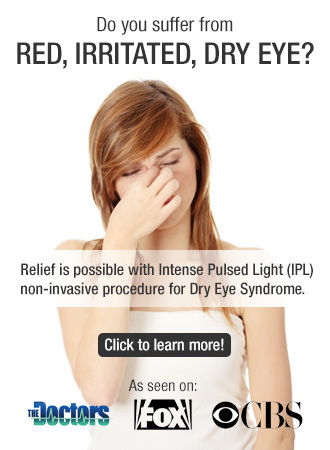 Visit ReVision’s website revisioneyes.com to learn more about IPL for dry eye. Click the button below to add the ReVision Dry Eyes Treatment to your wish list.